what a great site - I am constantly amazed by the wonderful web and all the generous offerings therin! enjoy your visit to value village - sounds just my thing! Awesome! Love the exploding pizza intarsia. Way cool! A knit Ceeb logo -- I love it! Why did you not decide to go for the orange/yellow/red colour combo? Either way, it's going to be awesome. OH you are sooo brave! hehe i honestly just knit hats and scarves sigh...it still requires INTENSE concentration for me! WOW! I cannot wait to see the finished product! Wow! I'm a total beginner in the knitting department so I'm not going to try this any time soon! CBC pride! Yay! 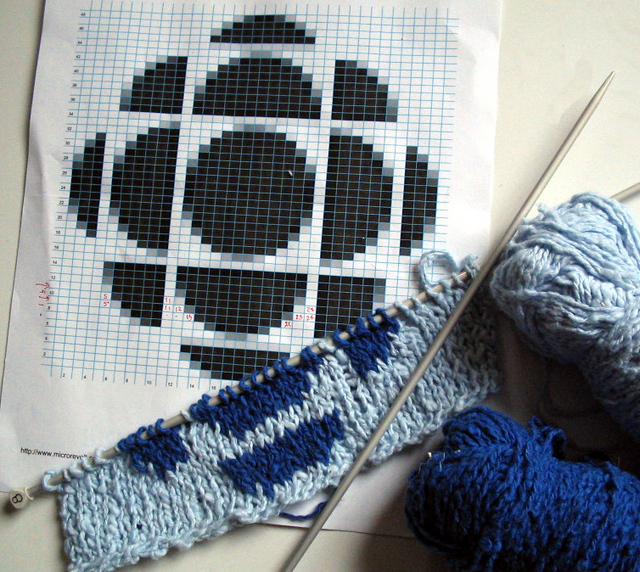 I made that CBC intarsia pattern too, ages ago, but haven't made anything yet. I was thinking of a wrist cuff.